A while back, I wrote a couple of posts about the Blocks – St Monans’ famous zig-zag pier. The first was about photographers who flock to photograph it, coming from the far flung corners of the world (wherever they may be). The second showed it in varying lights and weather conditions, but mostly tranquil. Of course, a lot of the time, the sea around the Blocks is anything but tranquil, and so I always planned to have at least one more post with pictures of the pier that show the dramatic force of the sea in stormy weather as waves crash against it, sending fantails of spray many metres into the air. 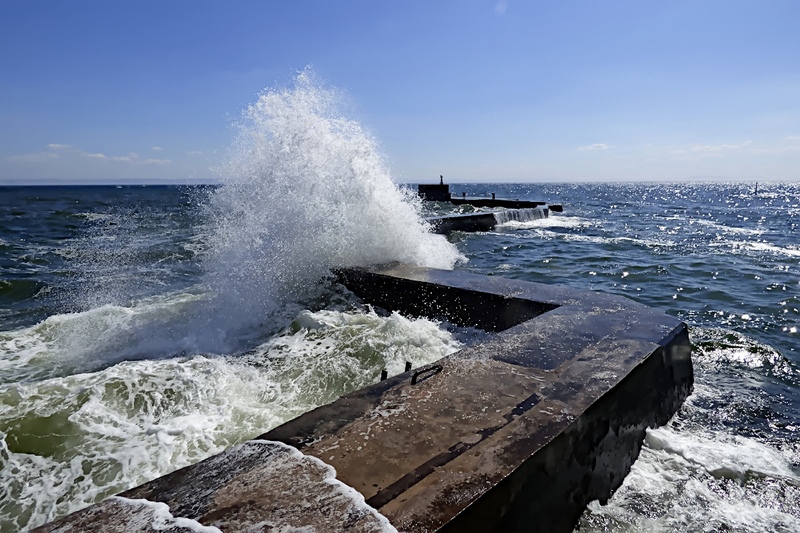 At such times, you would find it extremely difficult to stand where the photographers stand without getting very wet, and you might run the risk of being swept off the harbour wall by the force of the waves. Forget the long exposures, there’s no glassy sea to be had in those conditions. 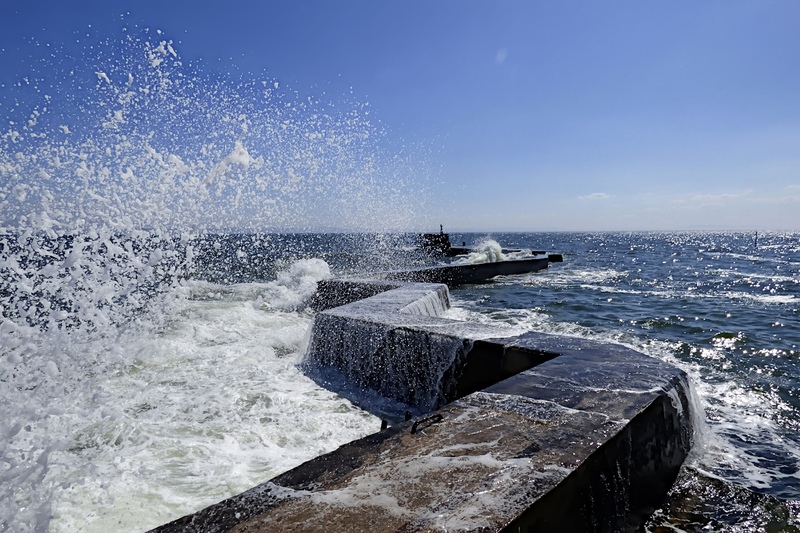 This photo and the next were taken from the harbour wall – I had carefully positioned myself just outside the arc of the spray landing about a metre to my left. After I retreated from that position, I took a few shots of the Kirk through the spray – I’ll share them with you in another post. When the weather gets really wild, it can be very hard to capture the ferocity of the waves. If you are safely indoors, the window is likely to be splattered with rain, and if you open the window or go outside, it’s a constant battle to keep your lens and camera dry. We’ve all taken photos that would have been great apart from the blurry bit. There are times when taking long exposure photographs with a tripod on the outer wall of the harbour is … well, … simply impossible. The seething sea captured from the West End beach as a plume rises over the pier. Even without high waves, the blocks can still be a treacherous place to be. … to ferry you back to safety.